He may be a member of the family, but sometimes your dog sure doesn't smell like one. Rolling around in the dirt. Getting into things he shouldn't. Accidents that happen more often than you'd like. All of these things can leave your pet - not to mention your rugs - smelling like the furthest thing from roses. And even after you give him (and your carpet) a good scrubbing, pet odors can still linger. 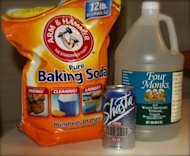 So we asked the team atbrightnest.com to test four pet-safe common household products, like club soda, that can eliminate those funky ground-level stains and scents. "While my wife and I were out of the country, our dog sitter let my two Golden Retrievers explore the tomato garden," says BrightNest CEO Justin Anthony. "If you don't know what happens when dogs dine on tomatos, let me share - a very messy carpet. So I asked our team to explore the best techniques for turning my living room back into a space where you'd want to live." If you have a urine spot on your carpet that's still wet, opt for eco-friendly white vinegar, which neutralizes odors due to its high acidity - and works well even if the stain or smell has been there for a while. Start by blotting the area, rather than rubbing it, which will only push the stain further into the carpeting fibers. Then mix equal parts white vinegar and cold water, and pour the mixture generously over the soiled section. Blot well, and then let it dry. (A fan can speed up the process.) Once dry, run a vacuum over the area. For a urine spot that has already dried, sprinkle a generous amount of baking soda over the soiled section, and then let it sit for a couple hours before vacuuming. Dr. Tina Wismer, DVM, DABVT, DABT, medical director of the ASPCA Poison Control Center, just advises owners to use a baby gate or an overturned laundry basket to keep pets away from the area while the baking soda sets. Although this cleaning method is safe to use in homes with critters, "if ingested, baking soda can cause stomach upset and electrolyte imbalances," says Dr. Wismer. When it comes to pre-treating a soiled carpet, club soda works great for nearly any type of pet stain. Since it's only effective while the soda is effervescing, the treatment may need to be applied several times. Start by blotting the section before pouring the club soda over it. Once the solution has stopped fizzing, immediately blot the spot again, repeating as necessary. If the stain isn't fresh, you'll likely need to follow up with the above baking soda treatment.